Despite great interest, there is a lack of common knowledge about cat healthcare. Oftentimes, we’re at a loss when our sick cats seem out of sorts. It can make you feel helpless. Spotting symptoms early will lead to quick treatment, and less overall stress for your pet. 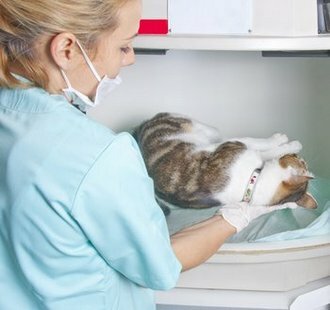 Remember that only your veterinarian can properly diagnose and treat a sick cat's illnesses, but in the name of preparedness: here’s a short list of common illnesses, the symptoms, and the general treatment a veterinarian might offer. Cats can get urinary tract infections just like people. Signs of this in cats will vary depending on circumstance. Many cats will whine when using the litter box, and you might find blood in their urine. They may also have accidents even if they are otherwise housetrained. You may notice your cat making frequent trips to the box but they seem to have trouble doing their business. UTI’s will range significantly in severity and you may not even know that there is a problem. These extremely mild cases will most often clear up before you become aware of an issue. If however, you do notice something’s wrong, it’s probably time to visit your veterinarian. Antibiotics are the common first step in treating UTI’s and will most likely clear up the problem so long as it’s diagnosed early. Your veterinarian should do a series of tests to determine the origin of the problem. In some cases, the infection may spread to the kidney and the situation becomes more complicated. Your kitty could be in a lot of pain. If you see any of these symptoms, make an appointment as soon as possible. Because any blockage that prevents your cat from urinating can become life threatening very quickly. This is much like a human cold. The good news is that it’s rare for an indoor pet to contract this infection. This illness is contagious and one cat must come in contact with another to catch it. If your cats stay inside and you don't go around petting every sick kitty you see then you probably don’t have to worry about it. Cats that do go outside however, are significantly more at risk. A cat with a respiratory infection will sneeze, cough, have a runny nose, or even develop a fever. You may also notice watery eyes and a raspy meow. In many cases, this is only a minor annoyance to the cat and veterinarian’s visits won’t be needed. If you notice your cat is not eating or drinking or seems lethargic, they may be very sick so schedule a visit ASAP. URI’s are generally caused by viruses. Antibiotics are generally administered not to treat the virus but to hold off any secondary bacterial problems that can pop up while your cat is sick. Your veterinarian may also give your cat medications to break up mucus so your cat can breathe easier. In severe cases your cat may become dehydrated and will require a fluid drip. That’s all for now, Check back tomorrow for part 2 of this list!